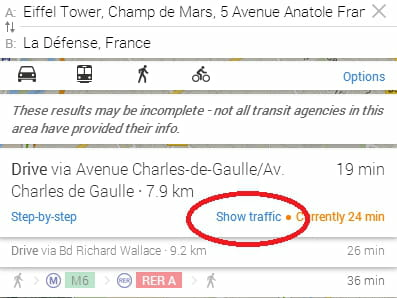 With Google Maps, not only you can calculate routes, but also be informed about the current traffic situation. In this tip guide we will show you how to enable this feature under Google Maps. A new color code will be applied to the route selected (including alternate ones). Green for fast traffic and red for slow traffic. Published by deri58. Latest update on September 10, 2013 at 07:10 AM by deri58. This document, titled "Google Maps - Show traffic info," is available under the Creative Commons license. Any copy, reuse, or modification of the content should be sufficiently credited to CCM (https://ccm.net/). Google Maps - How to get the geographical coordinates of a specific location?